Have people forgotten one of the cardinal rules? Do unto others? If you don't have something nice to say, don't say anything at all? I have personally experience some hateful things in the polish community. I once confronted a contest entry that was using my nail art to win a contest. I asked them to remove the entry as it was mine (and breaking the rules of the contest). It turned into one of the worst and most hateful posts I've ever read. Two girls and their mother were primarily responsible for the hateful comments, calling readers in support of my request that the entrant remove the post "morons", "losers", and "retards". I couldn't believe that sort of thing was happening, and that an entire family had rallied around such a hurtful cause. The kicker was that the mother scolded me for not stopping the behavior, calling me a bully. Everyone is entitled to their opinion, just as everyone is entitled to a vote. You may not agree with that opinion, and there's absolutely nothing wrong with that. But if you feel the need to express your disapproval, do so in a respectful way. There are differences between arguments and discussions, constructive and destructive criticism, and being opinionated and being hurtful. Take a second to reflect on what you have to say and how it might make others feel before you express yourself. There's a serious sense of commradory and community I feel when I blog and get comments from readers. It's this sense of togetherness that inspired tonight's No H8 manicure. Let's all support each other in everything we do, and leave the bullying to the bulls. My inspiration for this design came from this stock image. You can share your support along with the list of bloggers below. I was personally inspired to do this post by Lindsey at Neverland Nail Blog, who could be quite possibly the sweetest blogger I've ever come across. Wowowowow this manicure is GREAT! I am sorry you had to suffer such mean multi generational abuse : ( That is so terrible! Hate is so sucky! I am proud of you and all the bloggers who are confronting this issue together! I appreciate it a lot as I am a bullying victim too. I hope this movement spreads beyond nail blogs. Can we put the No H8 logo on our blogs? Absolutely! I grabbed mine from Lindsey's blog. Definitely spread the word! Do you know how to get the links of other bloggers into my blog post? I've added my link but I'm not sure how to get it all in my post. Here's the link to the code, which you can copy using the HTML function of your blog post: http://www.inlinkz.com/script.php?id=209435&nojump=1&key=ILvt%2F7LV2mN4w. 1. Thank you for your kind words, I'm truly touched! I admire you and your blog A LOT, you're a huge inspiration to me! 2. I found those resources from the lovely Jodi of Captivating Claws, so it seems the chain of inspiration goes even deeper...love it =]! 3. This mani is INCREDIBLE. Seriously, it's so beautiful and perfectly encompasses what this day is all about! Well said! I've seen quite a few pretty purple manis today. I like the message that is being sent. Let's hope it makes a difference. I love what you did, the hands shaped like a heart are very clever. Nice job! 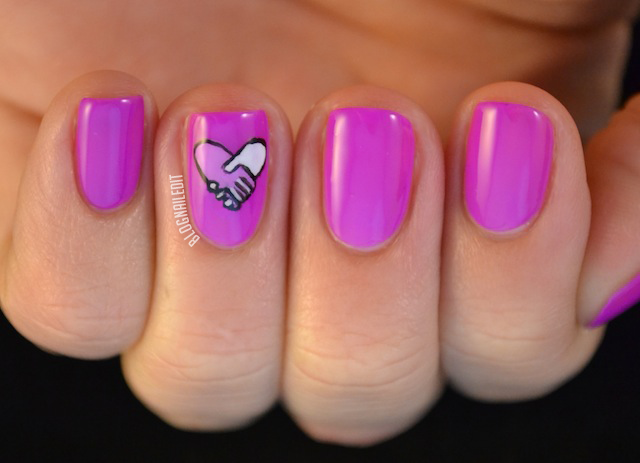 Well written and so pretty nailart! This perfectly encompasses the theme! Absolutely love it Katy! This is just beautiful! I love how you interpreted this theme! Fantastic mani! Gorgeous color and I love the art as well as the message. I'm so sorry you experienced that :( I wish we could all just be friendly or at the very least courteous towards each other. I also really wish I hadn't had work obligations all week and woulda been a part of this! The color is eye-catching! Beautiful job on the deatil - it encompasses what the blog community is about. do i have to be a blogger or have my own blog to link or share NO H8 NAILS?? Nope, you can add any link to an image. THANK YOU for your blog, the nail art & most especially the NO H8 campaign. If we witness bullying, then turn around & do nothing then what does that make us. I love Ellen DeGeneres last words, as she closes her show each day..."Be Kind to one another". LOVE IT!